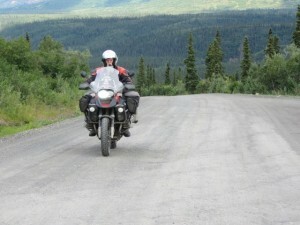 Alaska is made for motorcycles. During the summer they come from Canada, the lower 48 states and overseas to enjoy the roads and the scenery. It is awesome and tests man and machine. The Aussies at Tok - Mike, Dave, Shirl, Brian, Ken & Carol - party time! 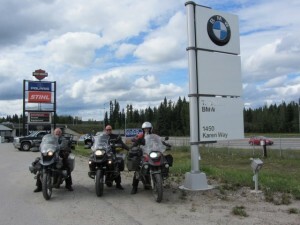 Crossing from Canada we hit the tiny town of Tok and stayed at Thompson’s Eagle Claw Motorcycle Campground. 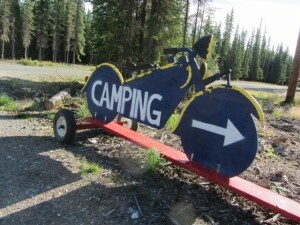 It’s a bikers’ only campground with very basic facilities nestled in the woods on the edge of town. 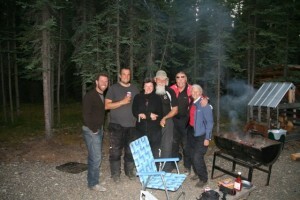 It was party time for us – catching up with our buddies Ken & Carol Duval and meeting up with Mike and Dave from www.adelaidetoanchorage.com..
Next stop Fairbanks, where we’d booked into the university campus staying in their student accommodation. Who should be there but David Hand and his mate John Blood. We met David in Smithers while we were waiting for our shocker and John in Hyder. 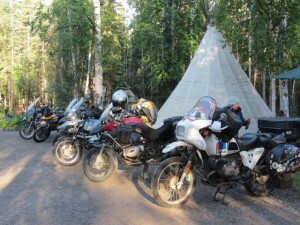 They were planning to ride to Deadhorse – as far as the road goes, so we will make the run up together. After a couple of days we all moved to the Go North hostel where Nicole and Christian and Kati and Jens were camping. We met all of them in Ushuaia at Christmas and the plan was to see the top of the world together as we’d seen the bottom of the world together. Ken & Carol were coming too. 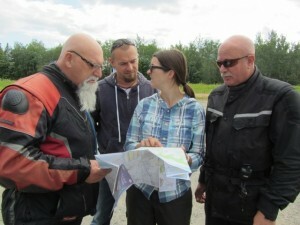 Slowly plans changed and it would be just Nicole and Christian in the Landy, John and David on their BMWs and us making the four day round trip to the Arctic Ocean. Santa suffered beard envy when he met Brian! 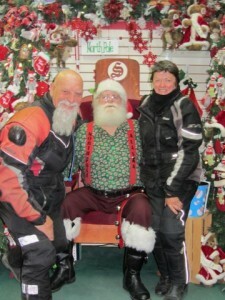 We visited North Pole, Alaska and meet with Santa. We put in a good word for all the kids! To fill in time before we headed north we took a two day trip to Denali National Park. The roads were good. 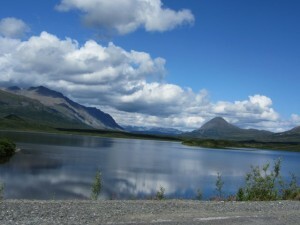 The scenery was amazing, even though Mt McKinley stayed hidden in the clouds. And in Alaska there is always the wildlife. 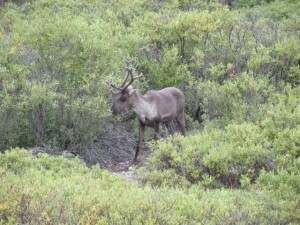 We spotted caribou feeding in the grasses on the side of the road. 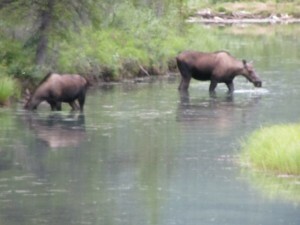 And moose didn’t care that we were watching them as they ate in the lake just metres from the highway. Heading back to Fairbanks we took the Denali Highway, about 200 ks of good dirt running alongside the Alaska Range. At just about every corner we turned the mountains turned on their charm. 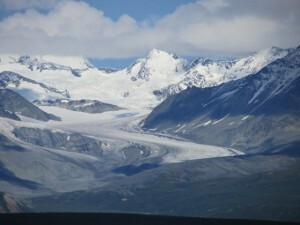 The snow covered peaks and the glaciers – a very high wow factor. Back in Fairbanks there was one last trip to the laundry and the supermarket and we were on the road for the Arctic Ocean…it will be a significant moment for us when we reach the end of the road at the top of the world.